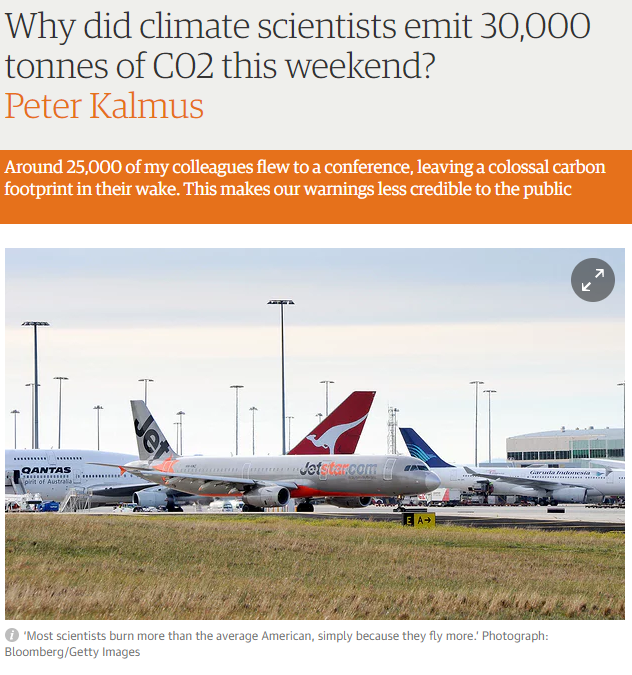 “Why did climate scientists emit 30,000 tonnes of CO2 this weekend?” | Watts Up With That? Q. Why did climate scientists emit 30,000 tonnes of CO2 this weekend? A. To get to New Orleans to attend the AGU’s Fall Meeting. I’m not alone. Over 400 academics have signed a petition at flyingless.org, and a few Earth scientists have joined me in telling their stories at noflyclimatesci.org. Like academics, climate activists also tend to fly a lot. Burning fossil fuel causes real harm, and will become socially unacceptable sooner or later. Do scientists fly more than the “average American”? I haven’t see any evidence that scientists fly more frequently than other business professionals. Americans make more than 405 million long-distance business trips per year, accounting for 16% of all long-distance travel (see Box A), according to a preliminary analysis of the National Household Travel Survey (NHTS). Conducted from 2001 to 2002, the NHTS asked 60,000 people in 26,000 U.S. households about all trips they took in a given travel period and looked at the characteristics of those travelers and trips. This report examines early NHTS findings on domestic business trips to destinations at least 50 miles from home. Contrary to the stereotypical image of the business traveler heading off to catch a cross-country flight, the majority of long-distance business trips in the United States are taken to destinations within 250 miles of home and are by automobile. Nearly three-fourths (74%) are less than 250 miles from the point of departure and most of those are within 100 miles. Trips of over 1,000 miles account for only about 7% of all business trips. (See Figure 1). Still, at 123 miles, the median one-way distance for business trips is greater than that for trips with other purposes. By comparison, the median distance for pleasure travel is 114 miles and for personal or family business trips the median distance is 103 miles. Long-distance commuting trips have a median distance of 69 miles. The personal vehicle is the dominant travel mode for business travel, comprising 81% of all trips. Air travel accounts for about 16% of all business trips. The use of the two primary modes shifts, however, as trip distance gets longer. Almost all shorter trips are by personal vehicle—97% of 50 to 99 mile trips and nearly 94% of 100 to 249 mile trips. In the 250- to 499-mile range, the personal vehicle’s share of trips declines to 67%, while the airplane accounts for 31% of the trips. Only after the 500-mile mark does the car give way to the airplane as the dominant mode of business travel. For trips 500 to 749 miles in length, air captures 64%, compared to 33% by personal vehicle. Of business trips between 750 and 1,500 miles, air captures almost 85%, and of trips more than 1,500 miles in distance, a full 90% are made by air. Accordingly, this yields a median trip distance for business travel by car of 102 miles, but one of 816 miles for business travel by air. Because the majority of business trips are less than 250 miles in length, it is not surprising that 84% of business trips (341 million business trips) do not cross census region boundaries1 (Figure 2). The origins and destinations of the 64 million inter-regional trips are not evenly distributed. The West attracts 7.4 million more inbound business trips than it sends to other regions. The South, on the other hand, has 7.7 million fewer inbound business trips than outbound. There is no statistically detectable difference between the inbound and outbound flows2 in the Northeast and Midwest. The South is the largest destination for outbound business trips from each region. Also, the South is the largest generator of inbound business trips to each of the other regions. The typical business traveler is likely to be male; work in a professional, managerial, or technical position; be 30 to 49 years old; and have an income well above the population average. Men account for more than three-fourths (77%) of business trips. This compares to nonbusiness travel where men take 54% of the trips and women 46%. Those who consider their occupation to be professional, managerial, or technical account for over half (53%) of all business trips. This occupational category represents only about 40% of the general population. Sales or service workers account for the next largest share of business trips, 28%. On the other hand, clerical/administrative workers account for less than 4% of business trips even though they represent almost 12% of the population. About 55% of all business trips are made by individuals aged 30 to 49. Those in their thirties take 28% of the trips while comprising 16% of the population. Those in their forties take 27% of the trips while comprising 15% of the population. The percentage of trips represented by those in their fifties drops markedly, with only 18% of business trips represented by this age group. Overall, this age group accounts for about 11% of the population. The youngest and oldest groups of adult business travelers, 18 to 29 and 60+ years old, represent about 16% and 10% of business trips, respectively. Business trips are generally made by those with household incomes that exceed the national average, which is about $47,500, according to the Bureau of Labor Statistics. Although 12% of households have annual incomes of $100,000 or more, the NHTS survey found that this income group accounts for over one-fourth (27%) of business trips. Another 18% of trips are made by those with household incomes between $75,000 and $99,000. There are relatively few low-income business travelers. Although 21% of households have incomes of $25,000 or less, only 6% of the business trips are made by that income group. I suppose academic and government scientists might take more long flights to conferences, while most business flights are relatively short-distance. I tend to fly a lot, between Dallas and Houston… So do a lot of other people. It’s probably Southwest Airlines’ most “popular” route. While I don’t personally know every geoscientist who flies this route, I rarely see any that I know on the same flight with me. Most of the business travelers are wearing suits or at least jackets and ties… making it unlikely that they are geologists or geophysicists. My SWAG is that most of them are sales people, lawyers, bankers and other finance people. My other option is to drive my Jeep between Dallas and Houston; which I do more often than I fly. I’m going to take another SWAG and say that my Jeep has a bigger carbon footprint than my seat on a SWA Boeing 737. According to the ICAO calculator, each of my SWA round trips puts 260 lbs of CO2 in the atmosphere. The EPA says that burning gasoline emits 8,887 grams CO2/ gallon, about 20 lbs./gallon. It’s about a 500 mile round trip and my Jeep gets about 18 miles per gallon. I burn about 28 gallons of gasoline on each round trip. This works out to 556 lbs. CO2. So, if I cared about reducing my carbon footprint, I would fly rather than drive. As scientists, our work informs us – with dreadful clarity and urgency – that burning fossil fuel is destroying the life support systems on our planet. I recently ran across a survey of scientists (ca 2006) with real jobs and it tells a different story. AAPG does recognize that pollution from fossil fuels is harmful to the environment. We also acknowledge that high levels of atmospheric CO2 could impact global temperatures. As such, we continue to advocate and support voluntary actions that stimulate the use of clean energy technologies and reduction of fossil fuel emissions. It must be noted, however, that the world is dependent on fossil fuels to meet its growing energy demand, and will remain so for many decades. We recognize that we are thus conflicted in how we are perceived in this debate. That perception of conflict does not mitigate, however, the very compelling reality that it is unreasonable to ask society to give up its economic prosperity to mitigate increased levels of CO2. The climate debate is far from over and must be discussed and further debated. 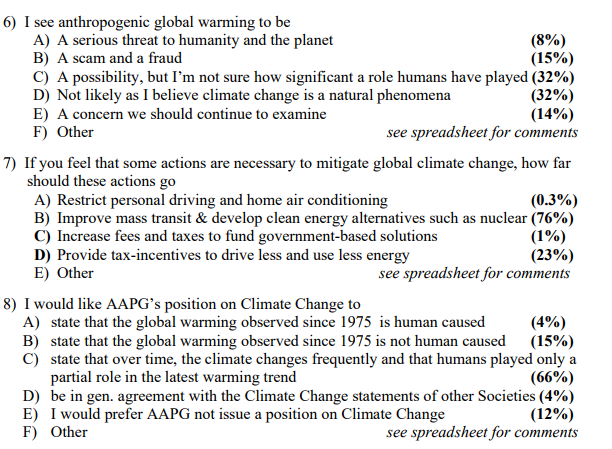 AAPG calls on both sides of the issue of anthropogenic global warming to conduct this debate in a more professional manner than has been done so in the past. As a result of the politicization of AGW, data manipulation, alarmism, indoctrination, exaggeration, name-calling, and extortion, have all entered into; and influenced the tone of the debate. These have no place in science, and the professional community must stand together to condemn these unprofessional and unethical behaviors. While “pollution from fossil fuels is [somewhat] harmful to the environment,” the benefits fossil fuels have provided to human well-being far outweigh any negative effects from the pollution. I applaud Dr. Kalmus for having the courage to “walk the walk.” However, he and his 400 fellow No-fly-climate-science Guys & Gals, would be better off flying to important conferences and meetings. If Dr. Kalmus’ work at JPL and the AGU Fall Meeting are integral to saving the planet from Gorebal Warming, he shouldn’t be wasting time by taking the train instead of flying. I just can’t get enough of this George Carlin sketch! David, I completely disagree with you on this. Any way you slice it, air travel creates pollution. Whether or not it contributes to global warming, and whether or not global warming is good or bad, it’s still pollution. There’s no need for most of these conferences and meetings to be held in-person. With today’s internet technology, video conferencing can and should replace most in-person conferences and meetings. Plus the amount of man-hours wasted in travel time could definitely be better used. Yeah but if you don’t go you don’t get to hob-nob with your pals on someone else’s dime. By pollution do you mean CO2? Aircraft exhaust contains a number of things smoke, unburnt hydrocarbon fuel, oxides of nitrogen, oxides of carbon and biological material picked up from the atmosphere and combusted. It seems to me ,from some articles I read on on here, some people seem to think our very existence on the planet is ”Pollution’ ‘& .Almost any activity on our part could be put in that category ,including using the lavatory .! ldb: None of those pollutants do much for global warming. In almost two decades of being concerned with combustion products from fuel combustion (CI engines) I’ve never seen anyone concerned about combusted biological materials picked up from the air and they would be at theoretically higher concentrations. Even ignoring that, Tom, I think what the author was getting at is that if you don’t attend the meetings, you cannot influence policy. Yes, it would be best if no one went to the meetings and it’s all done electronically. Cheaper, less waste, more accessible. However, if you go and others don’t, you have more influence and power. Therefore, everyone who wants to influence the results has to go to the meeting. It’s a Nash equilibrium. Very interesting. As in Russell Crowe? Its another one of those paradoxes screwing humans over. Like – the only way to rapidly reduce CO2 emissions is to shut down industry but if you do that you get even more warming through reduced aerosols because it is a much faster acting effect. Oh well, what are you doing for christmas? So why doesn’t someone decide: don’t have the meetings at all? Do it by video-conference or whatever. It requires someone in authority to make a significant decision. If the meetings are scheduled, they will come. Nah, Tony. That’s a no-win situation, aka a catch-22 or Kobayashi Maru. A Nash equilibrium is akin to the classical Prisoner’s Dilemma, where everyone acting in their best interest gets to a situations that is objectively worse than if everyone worked together. This happens quite a bit, and yes, it was that Thomas Nash who it’s named after. A little piece of advice: if they stop eating beans, that will cut their emissions to nearly 10% of what they usually produce. And what “pollution” is that? Be specific. That statement assumes they have any credibility left after years of failed predictions and numerous taxpayer funded shrimp-fests. Does that include beer and champagne? Or even a soda? Am I really drinking ‘pollution’ when I have some coke? Is bad breath due to exhaled CO2? Kalmus could use Skype to organize a conference, but holding a decent party online. . .
Why is it that the physicists think they know anything about biology? Perhaps because they have extensive knowledge in Biology. Why would you quickly assume that an educated intelligent person can only have one field of knowledge? Knowledge is NOT mutually exclusive. One doesn’t have to erase information in the brain to accumulate other information. At Harvard they teach you less and less information about more and more subjects until you know nothing about everything. At MIT they teach us more and more information about less and less subjects until you know everything about nothing. what idiots didn’t like the “fake” French food in New Orleans are in Paris, money, money, money makes ?????? Based on that sort of “science”, California has proclaimed a desire to become less dependent on fossil fuels. I’ve been trying to envision how well a fleet of electric fire fighting equipment would perform in comparison to the fossil fuel burning equipment they’re using to combat the current wildfires. Well, you plug each one into that looooooooooooooong extension cord that is attached to the EV at the front of the line. EVs may work better. They don’t take energy to idle. Plus, no one escapes Florida, they just go to Orlando. I was vacationing in Orlando during hurricane Irma. Disney was full of Miami refugees, and no one was too panicked. Jeff, however the AC and radio are still drawing power. You could probably add in headlights if the line still exists when night falls. Good point. Florida is soooo hot during hurricane season AC is a must. I suspect that AC has a serious impact on EV range. Although a moron about climate, he at least walks the talk and avoids the rampant hypocrisy of most True Believers. Maybe, but his statement seems to have a measure of virtue signaling in it. On behalf of the plants, I want to thank those brave souls who have worked to make our lives easier and more productive by spreading life giving CO2 around the world. ” I want to thank those brave souls who have worked to make our lives easier and more productive by spreading life giving CO2 around the world…” by converting long dead plant material into green, living plant material. The 2006 survey of scientists with real jobs has a comments section. Those comments show a tremendous respect for the limitations of drawing concrete conclusions from the available data. Should note that question 4 of the survey is one of those biased leading questions that should be avoided in any survey. David – its starts with a statement of fact intended to influence the response – which is a big no no in any survey. In the Sks survey, they are slanting the results by first calling CO2 pollution (that’s begging the question) and by declaring that it causes global warming (yet to be proven). 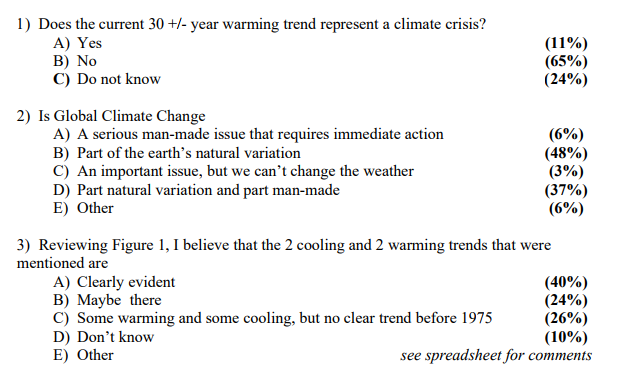 In this survey they are asking whether one temperature trend is more of a crisis than the previous temperature trend. Huge difference. Yep. It’s just a preamble statement. The question wouldn’t make much sense without it. The preamble to the question, while a statement of fact, is written in a manner to elicit a preferred response. You can’t condemn one side for a huge misleading statement while praising a less egregious version (more subtle version) of the same stunt. ie double standard. 1) Does the current 30 +/- year warming trend represent a climate crisis? 4) In the early 1970’s, climate scientists were warning of a climate crisis as a result of global cooling. Is the current warming trend more of a crisis than the cooling trend of 1940 – 1975? If anything, question 4 yielded a more Gorebotic response than question 1. 4) In the early 1970’s, climate scientists were dead wrong in their climate crisis warnings about global cooling. Should we believe their climate crisis warnings regarding the current 30 +/- year warming trend? Kalmus doesn’t mention the elephant in the room — where is the money for the trips (whether by air or car) coming from? Private business — that’s private. If it’s public money, then anyone paying taxes should have a say in how that money is used. The present cultural psychosis is that public-money recipients don’t believe that the public is their employer. Reminds me of the players rep for the Atlanta Braves during one of the baseball strikes. When a reporter mentioned to him how upset the fans were, he replied by declaring that it didn’t matter what the fans felt, since they weren’t the ones paying his salary. Somewhat true. About 40% of revenues are related to fan attendance (tickets, parking, concessions). The rest is from licensing, broadcast rights, etc, that don’t relate to having butts in the seats. The people who buy such merchandise are quite obviously fans as well. Offended fans don’t buy team merchandise. While some comments note the motivation for individual scientists to participate in such conferences that are not strictly science oriented, it should be noted the main motivation behind these large conferences is to provide revenue to the sponsoring organizations. The AGU, AMS, and AAAS generate large amounts of cash with these events. If forced to convert to teleconferencing they would not be able to charge the high per person fee nor get sweatheart treatment from hotels and conference centers. After all an entire laboratory could sit in on many talks while paying for only one connection. Ending such in-person conferences would hit these organizations in the pocket book. Well with New Orleans being know as a party city and anything goes who would teleconference. Hey what happens in New Orleans stays in New Orleans. I know of one thing that won’t stay in New Orleans. Though a shot of penicillin will usually take care of it. 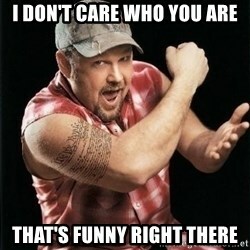 You obviously haven’t looked at You Tube lately. At least he is challenging the end user and not the producer of the fuel. Not to mention holographic presentations. They’re offered commercially down this way these days. Some poor sucker taxpayer has funded this [pruned] report laden with irrelevant BS. The author should have stayed in bed. In business, money is saved by having Net Meetings. If profits allow it, then boondoggles are sometimes used to reward employees. Then there’s…me. I’m working on a project at LaGuardia airport. There is frequently pressure to provide a live body at the meetings. Our first response is “Can you send me a Skype/Bluejeans/GoToMeeting invitation?” Travel to the airport from outside NYC is a bear under normal circumstances, but with the current construction we would spend 3X the meeting duration in travel. Untenable for the bottom line. I just emitted some CO2, but it was well short of 30K tonnes. I liked your comment and am glad I am not in the vicinity. But how long before somebody starts referring to 20kT of CO2 as a Hiroshima, and that this meeting resulted in one and half Hiroshima’s of carbon footprint ? Scaremongering at its finest. It’s always worse than we previously thought. It has to be. If it was better than we thought half of the time and worse than we thought the other half of the time… AGW would actually be science… /Sarc? Does Dr. Kalmus and other commenters realize, the air lines are going to fly these airplanes anyway? In my initial draft, I wrote that neither the climate nor the airlines will notice the 400 No-fly-climate-science Guys & Gals… But I decided that it was unnecessarily obnoxious. Airlines schedule planes based on expected traffic volume. At least Skyping would protect them from that kind of nonsense. This AGU meeting is about science. Yeah, sure. All of these meetings can be held over the Internet so such travel is no longer necessary. If one feels that the use of fossil fuels is bad then stop making use of all goods and services that make use of fossil fuels. It is your money that keeps the fossii fuel companies in business. So no longer make use of computer related devices, wear clothes, eat store bought foods, go inside of most buildings, or walk on surfaces made of asphault, concrete, wood, or synthetic material because they all involve the use of fossil fuels. Everytime you brethe out you add so called greenhouse gases to the atmosphere. Stop it! I find the whole carbon (dioxide) footprint due to flying somewhere ridiculous. When you buy an airline ticket, your are getting a seat on a plane that is going to fly from A to B whether you are on it or not. If you don’t buy a ticket someone else will likely be in the seat you didn’t take – airlines have been very good at filling their planes for years. So your not flying is likely to reduce aircraft emissions by about zero. Of course this does not apply to the super rich and famous who wouldn’t be caught dead on a commercial flight and travel by private jet. Their CO2 footprints are far larger than even the most frequent business travelers who fly commercial. You will of course not get frequent flyer miles so you’ll miss out on a chance to have your employer pay for the accumulation of enough miles to take your family on a nice vacation to Hawaii every few years. Something I suspect even the most environmentally conscious scientists may take advantage of. Airlines are good at filling seats because they have a lot of planes of varying size. If fewer people book that seat in advance, the airlines my schedule a smaller plane to fly that route. Or they may adjust the schedule so that 4 planes per day fly that route instead of 5. If I had a dime for every time a statement like that was made, I would be rich. If I had a dime for every time a statement like that was made, but no evidence was sited or reason was given for such clarity and urgency – I would be twice as rich! and i keep seeing stuff like this… The EPA says that burning gasoline emits 8,887 grams CO2/ gallon, about 20 lbs./gallon. a gallon of fuel doesnt weight 20lbs does it? how can what it generates be more than what the original liquid was? i didnt do chem at school but for the life of me i cant see how output can weigh more than input especially as a damned gas???? It seems impossible that a gallon of gasoline, which weighs about 6.3 pounds, could produce 20 pounds of carbon dioxide (CO2) when burned. However, most of the weight of the CO2 doesn’t come from the gasoline itself, but the oxygen in the air. When gasoline burns, the carbon and hydrogen separate. The hydrogen combines with oxygen to form water (H2O), and carbon combines with oxygen to form carbon dioxide (CO2). CO2 molecule with one carbon atom (atomic weight 12) and two oxygen atoms (atomic weight of 16 each)A carbon atom has a weight of 12, and each oxygen atom has a weight of 16, giving each single molecule of CO2 an atomic weight of 44 (12 from carbon and 32 from oxygen). Since gasoline is about 87% carbon and 13% hydrogen by weight, the carbon in a gallon of gasoline weighs 5.5 pounds (6.3 lbs. x .87). We can then multiply the weight of the carbon (5.5 pounds) by 3.7, which equals 20 pounds of CO2! He means models doesn’t he. The “dreadful clarity” comes out of a failed model ensemble doesn’t it. RCP8.5 has already turned Earth into Venus, several times over. Yes, cephus, it must be models, but I find it hard to believe that even the models are projecting the destruction of the “life support systems of the planet”! I am not sure how anyone can be taken the least bit seriously after making a statement that is so threatening and so completely unsupported. If only all catastrophic climate change “believers” would stay at home, turn down the heating, turn off the TV and the Internet, the world would be a better place. The word “hypocrite” comes to mind. Not in common understanding of the word, “Do as I say, not as I do.”. I smoke smoke. I told my kids not to smoke. The common understanding would say I’m a “hypocrite”. If I had told my kids not to smoke and then pretended I didn’t smoke, then I’d be a hypocrite. These people are hypocrites. In every sense of the word. Have these people not head of Skype, been around for a while? Pet peeve: People writing C02 (C zero 2) instead of CO2 (C Oh 2). Even more peevworthy, CO2 called carbon pollution. I cut & pasted it from the Grauniad… Never noticed the zero till you mentioned it. Will fix. Do as I say, not as I spew. Why? Because they’re ignorant useful tools in helping spread atmospheric fertilizer to help feed everybody on the planet. For this reason, and this reason alone, I can support their frivolity.